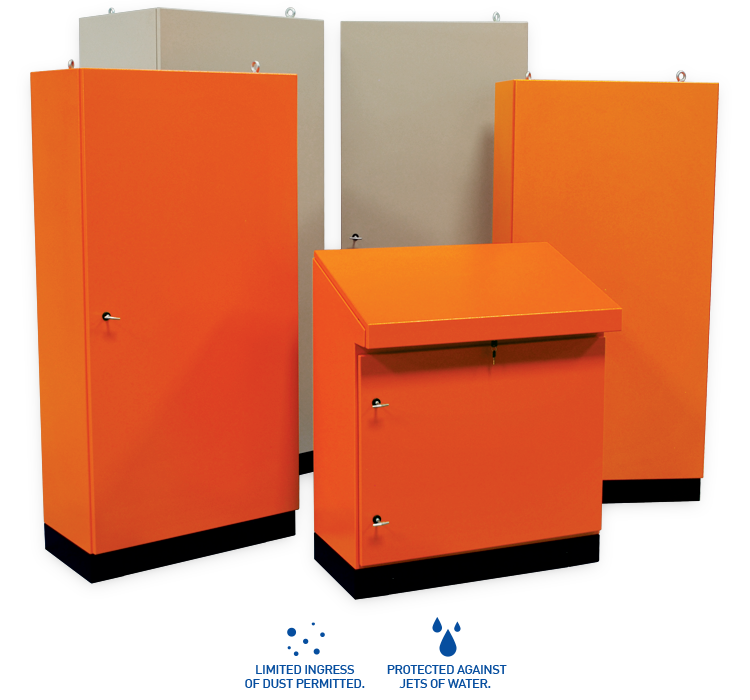 IP65 1.6mm Mild steel with powder coated white chassis plate, removable gland plate with polyurethane continuous gasket Various colours to choose from (Standard, Orange or Grey), Custom sizes available. 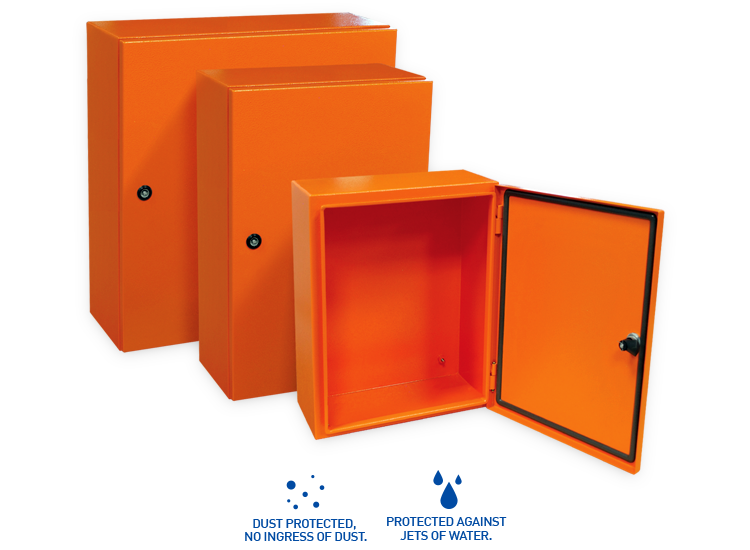 1.6mm Mild steel with powder coated white chassis plate, removable gland plate with polyurethane continuous gasket Various colours to choose from (Standard, Orange or Grey), Custom sizes available. IP55 1.6mm Mild steel with powder coated white chassis plate, removable gland plate with polyurethane continuous gasket Various colours to choose from (Standard, Orange or Grey), Custom sizes available. 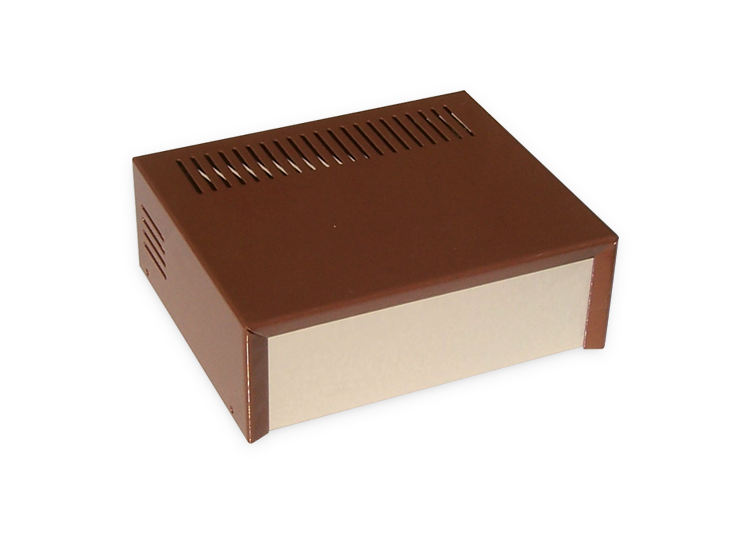 P.Beulich Sheet Metal Manufacturers range of electronic and all purpose boxes kept in stock and are readily available. These boxes can be adapted to accommodate electronic components and PC boards for the manufacture of control panels and any other application. 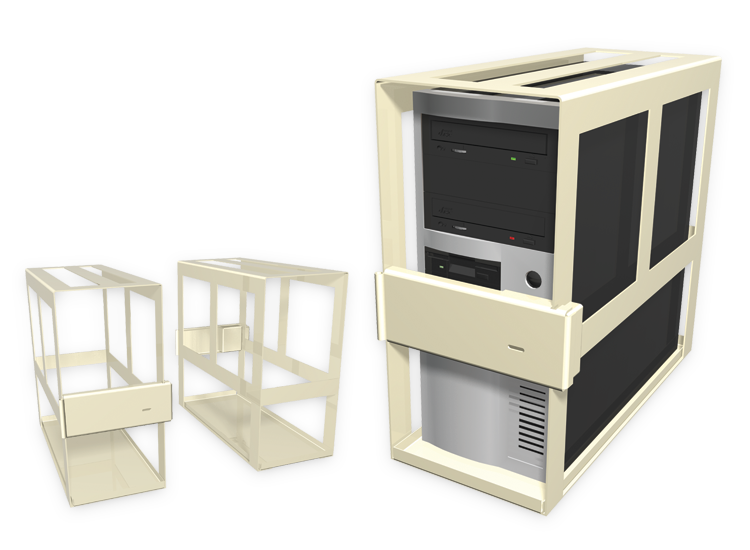 1.0mm Mild steel with powder coated medium beige chassis, Hinged door with lock that opens 90°, assembled to the back plate is a chassis plate for mounting of electronic/electrical components, knock outs are provided for cable entry. 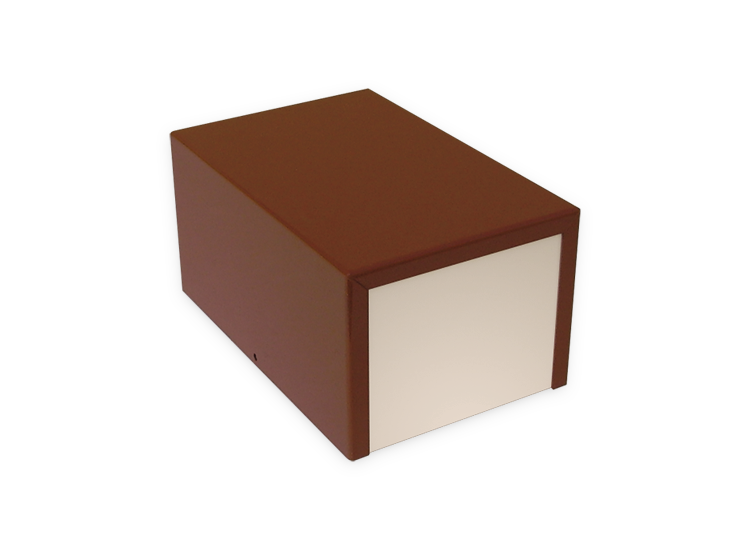 1.0mm Mild steel, Powder coated cover in golden brown and the base is medium beige. 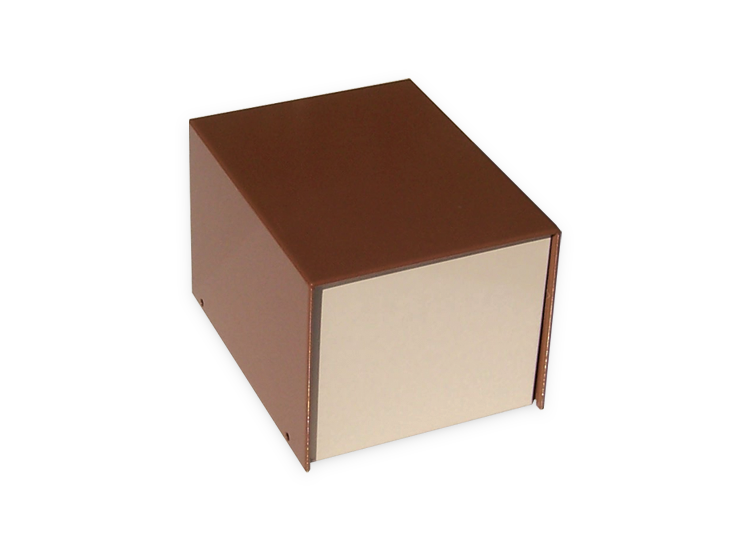 Inter locking base and cover, the visor effect on the front face of the all purpose box enclosures provide protection for instrumentation. Assembly screws and stick on rubber feet included. 0.8mm Mild steel with powder coated cover in golden brown and the base is medium beige. Simply constructed with flanges on the base for mounting PC boards etc. Assembly screws and stick on rubber feet included. 0.8mm Mild steel with powder coated cover in golden brown and the base is medium beige. Simply constructed with visor effect on the front face that provides protection to instrumentation. Assembly screws and stick on rubber feet included. 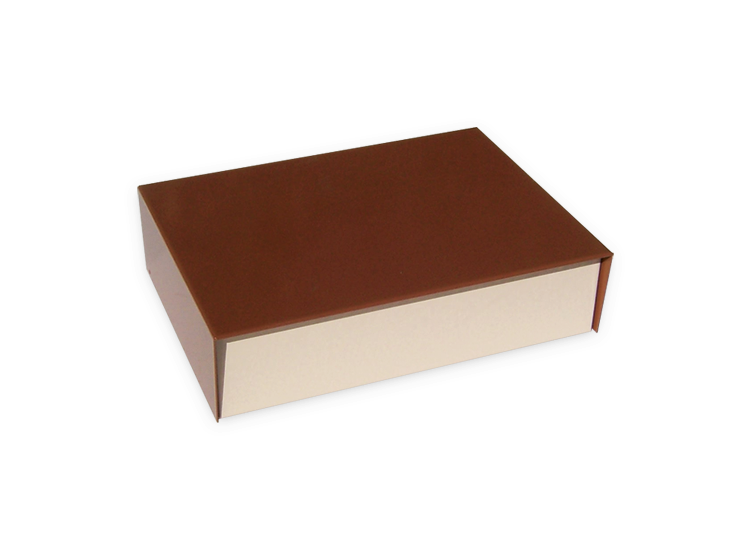 1.0mm Mild steel powder coated medium beige. 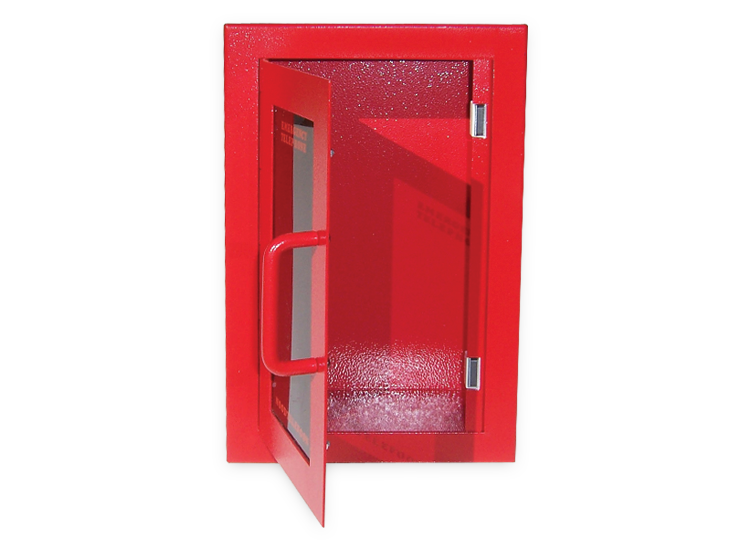 Hinged door with lock that opens 90°, knock outs are provided for cable entry. 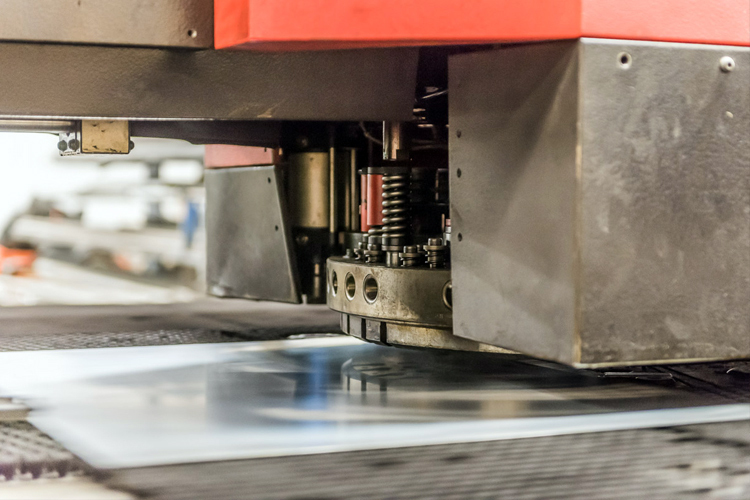 We use premium materials, leave no sharp-edges, create perfect welds and employ accurate punching and bending techniques. 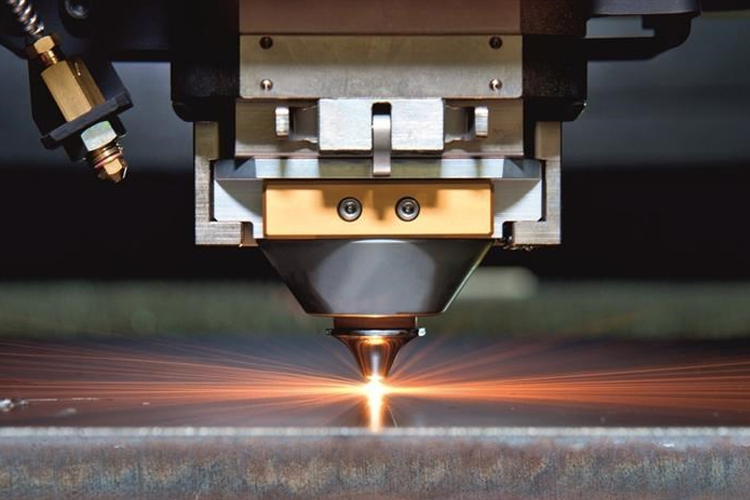 Whether it is a prototype part or large batches, all parts are machined to CAD and quality checked to allow the greatest accuracy and highest quality ensuring we meet exact requirements specified. 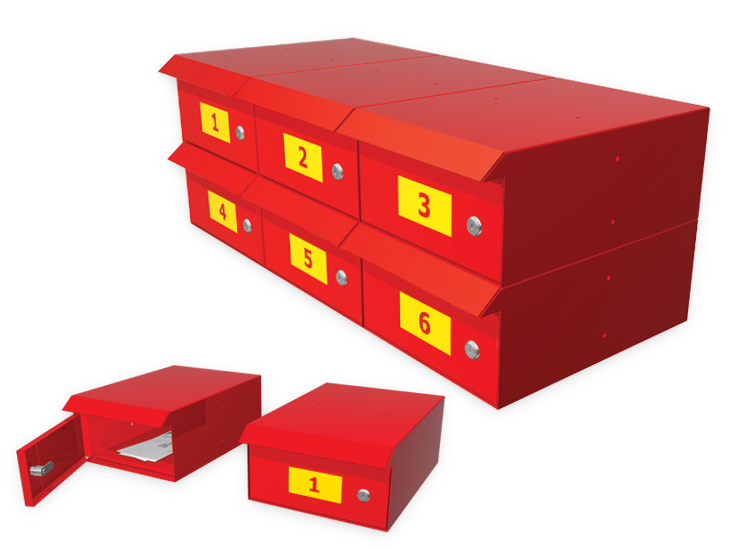 A post box system which can be put together in several combinations to make up the required quantity needed at your townhouse complex or golf estate. 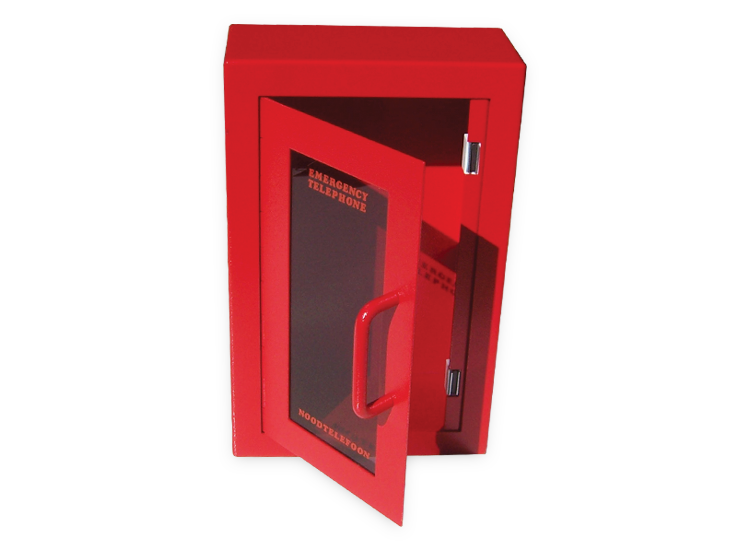 Manufactured from 1,2mm mild steel and powder coated in a colour of your choice selected from our range, each post box is lockable with individual keys for your privacy and security. Posting is done from outside, while retrieval is from inside the property via a lockable door. Posting and retrieval are both done on the front face of the post box, with retrieval still being via a lockable door. 1.2mm Mild steel powder coated cream ferrotex standard while any other colour within our stock range is at no extra cost. Our banking Trolley has 3 lockable drawers with smooth operating slide action. 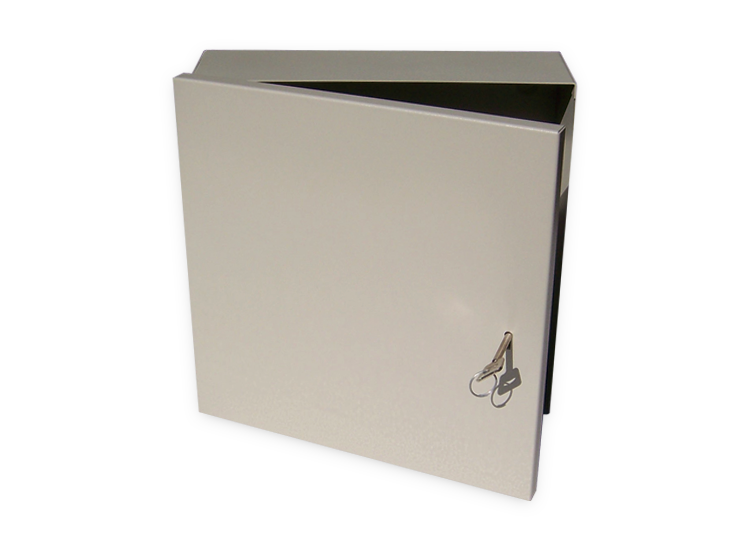 Unlocked drawers are kept in a closed position by a central locking device for extra security, Money tray and fully adjustable dividers included, Swivel castors with locking ability and a lockable bottom compartment for larger items. 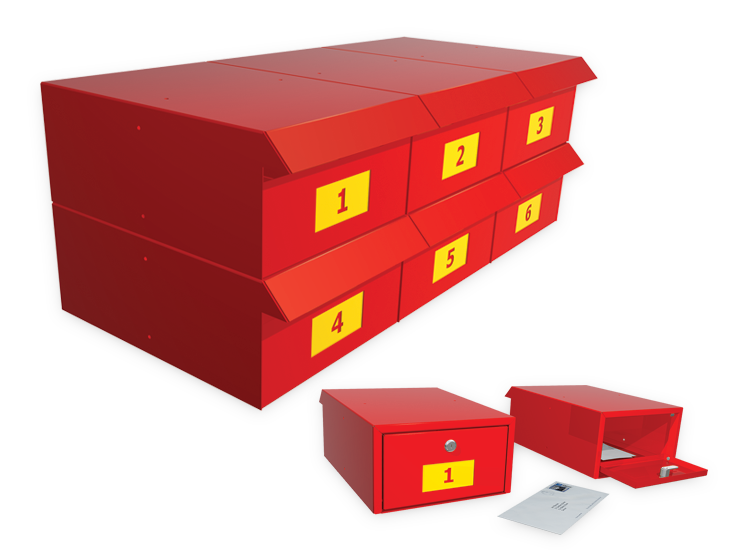 Optional Extras:Drawer size combinations can be manufactured to client specification. 1.2mm Mild steel powder coated cream ferrotex standard while any other colour within our stock range is at no extra cost. Our banking Trolley has 3 lockable drawers with smooth operating slide action. Unlocked drawers are kept in a closed position by a central locking device for extra security, Swivel castors with locking ability and a lockable bottom compartment for larger items. 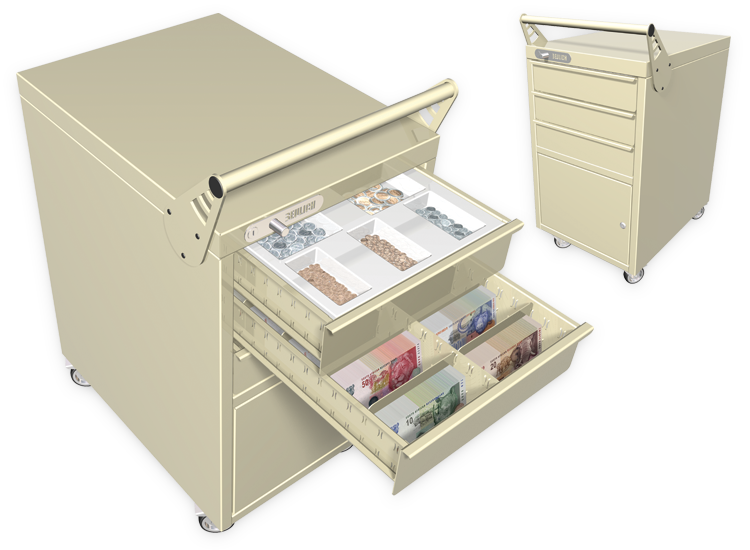 Optional Extras: Drawer size combinations can be manufactured to client specification, Drawers with fully adjustable dividers. The ultimate personal computer safe that can be bolted on to the floor or wall. 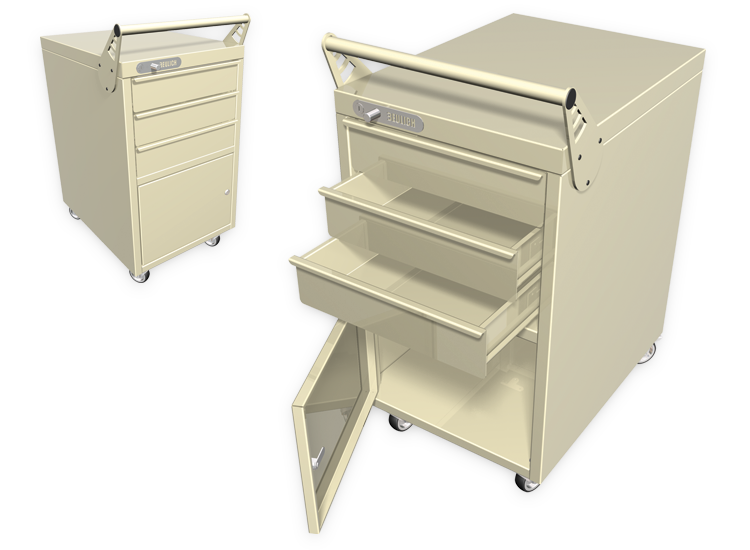 The Deluxe PC safe is manufactured from 1.6mm mild steel with powder coated cream forrotex chassis. Fully covering your computer with adequate ventilation and the locking door is fitted with a 4-lever dead lock for optimum security. 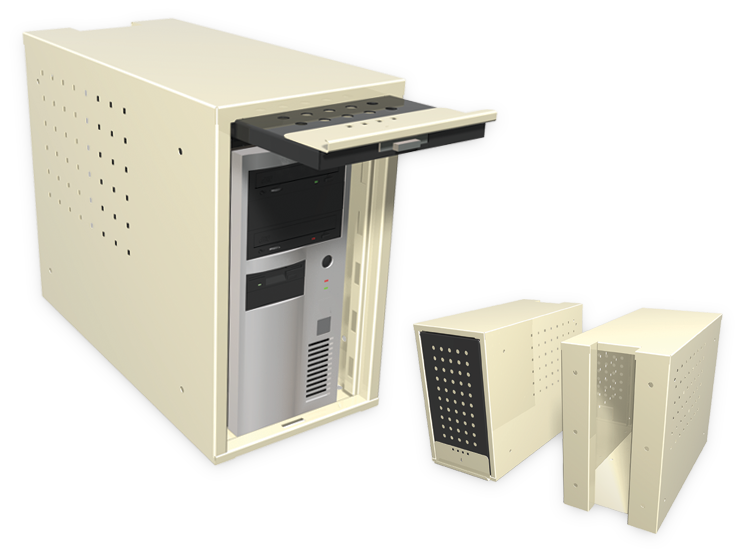 The ultimate personal computer safe that can be bolted on to the floor or wall. Safe keeps larger computers or servers. A full size door covering the entire front face of the computer which slides in place for full access during operation and smaller locking panel which can be locked in place permanently offering full access during operation while locked. The ultimate budget personal computer safe that can be bolted on to the floor or wall. 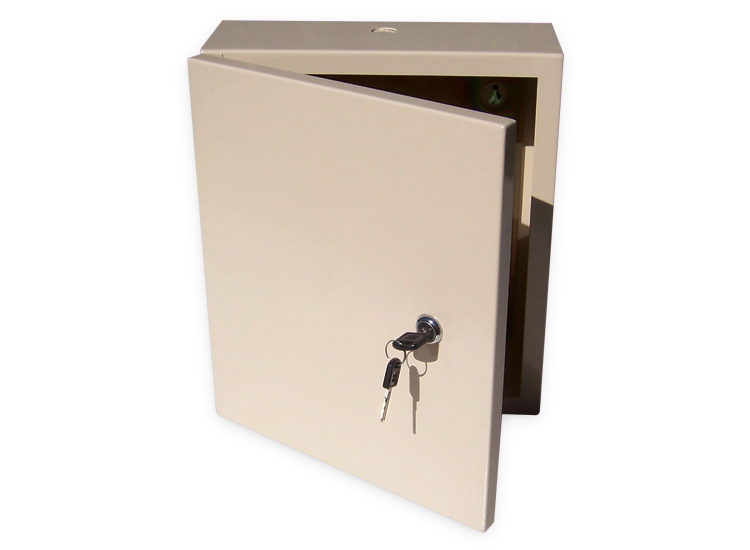 The Budget PC safe is manufactured from 3.0mm mild steel with powder coated cream forrotex frame. The front locking panel is fitted with a 4-lever dead lock for optimum security. 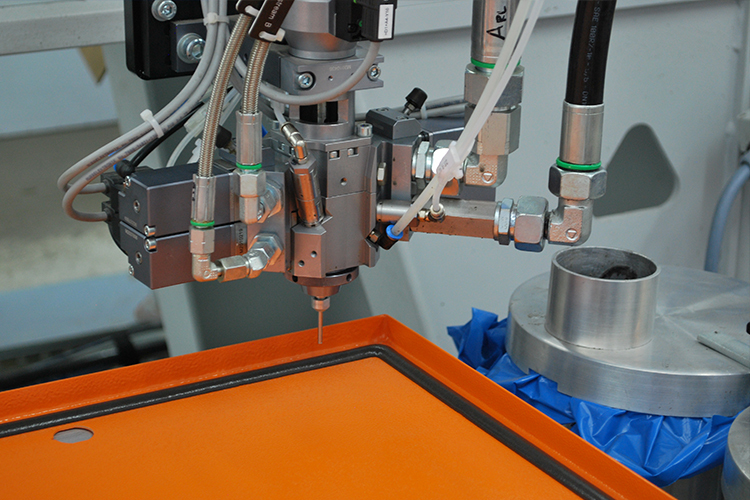 Strict quality control procedures, together with our effective production management software, guarantees on time delivery of all manufactured sheet metal products. 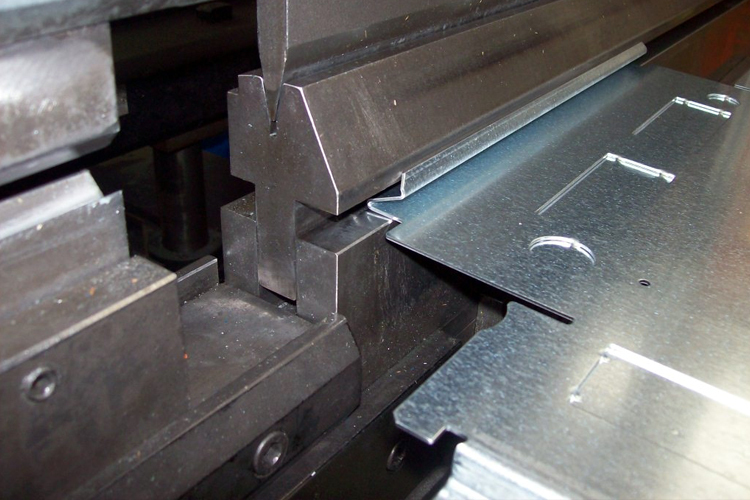 At P. Beulich Sheet Metal Manufacturers we believe in doing things the right way! Our Quality control process guarantees that our products are of the highest quality and meet to DQS & IQNet ISO 9001 standards.